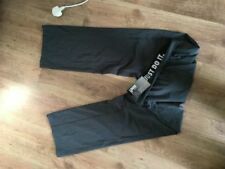 Ladies adidas cropped trousers size 14. Condition is very good Dispatched with Royal Mail 2nd Class. Available in size S/M to fit 10-12UK. BOUGHT FOR MY GRANDAUGHTER BUT IT WAS TOO SMALL. 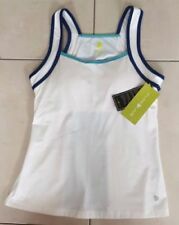 This bid is for three pieces of Elle Sport. 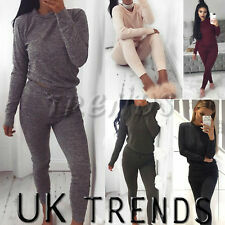 1 x Elle Sport sweat pant, full length , wide leg fit, elasticated waist. 1 x Elle Sport sweatshirt, zipped front, drawcord hood, two side front pockets. Both pieces are a matching set. Soft cotton elastane, colour is listed as black with pink print and tie ends. 1 x Elle Sport Performance Racer back vest . Cindy pink with blurred floral print panels. Concealed zip pocket at side front. Made from intelligent Dri Activ performance fabric which transports moisture from the body keeping the skin dry and cool throughout the toughest workouts. All three pieces are brand new without tags . HAPPY TO COMBINE POSTAGE WITH MY OTHER SPORTSWEAR ITEMS FOR SALE. 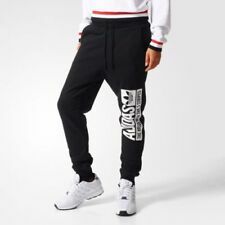 Elle Sport Sweatshirt Hoody And Cropped Sweat Pant, Medium 12, Brand New.